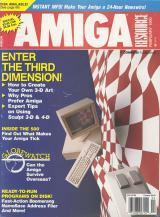 Cover Story Enter the third dimension! Globewatch: Can the Amiga survive overseas? Ready-to-run programs on disk! Fast-action Boomerang, NameBase, Address Filer and more! Instant info! Make your Amiga a 24-hour newswire!